Exposed beams are distinguished looking architectural features that bring depth and drama to ceilings. Ceiling beams can be found in practically any home style, from rustic to modern and it's easy to see why this look continues to enamor both builders and homeowners alike. Give exposed ceiling beams a contemporary style by painting them the same color as the ceiling. The ceiling will still have a textured, three-dimensional look with a more subtle effect. For a hint of contrast, use a darker shade or a lighter tint of the same color, such as white and cream. 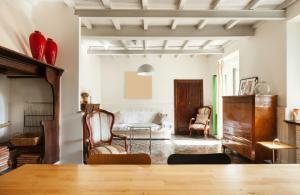 Painting the beams white makes them appear lighter and brightens the whole room. Ceiling beams stained or painted in deep, rich hues of brown, reddish brown, or black provide stark contrast against white walls and ceilings. The lined patterns they create instantly draw the eye up, bringing high vaulted or cathedral ceilings into focus with warmth and character. Create a look of unity in a room with dark stained ceiling beams by adding wood furniture, wood flooring, wall trim or cabinetry with the same deep wood tones. Add even more texture and pattern to a ceiling with exposed beams by installing beadboard planks in between the beams. This classic cottage look can be achieved in a variety of ways and with practically any type of exposed beams, from boxed beams to entire trusses. Paint the paneling and the beams white for a clean, contemporary look or leave the wood in a natural color and seal it with a clear varnish. Honey toned beadboard planks contrast beautifully against darker stained ceiling beams. 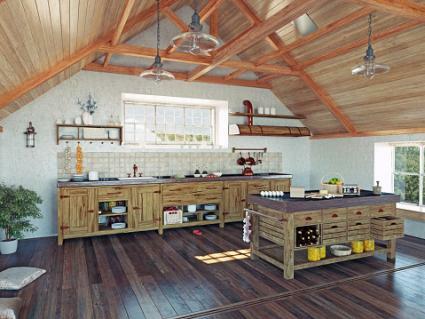 Don't be afraid to try some color on beadboard ceiling planks, especially in the kitchen. Muted blue or green looks stunning against natural wood ceiling beams. 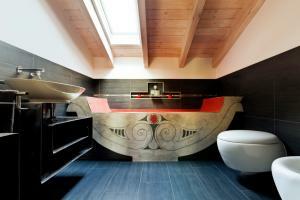 Exposed architectural elements fit perfectly with the industrial chic design trend. 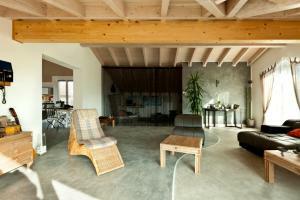 Wood ceiling beams and pipes instill a raw edge to posh urban decorating schemes and ultra-modern interiors. Steel ceiling beams bring an industrial twist to an elegant dining room. Complete the look with a barn wood or teak dining table, steel dining chairs and a rustic wrought iron chandelier. Track lights installed alongside or on exposed beams make a wonderfully chic accessory as do industrial style pendant lights hanging down from roughhewn or unfinished wood ceiling beams. Play up the natural look that exposed wood beams bring to a room by pairing them with other natural materials. Stone flooring or stone veneer wall panels incite an earthy vibe in a room with wood ceiling beams -- make it feel even cozier with faux fur rugs or fur blankets draped over furniture. Pay attention to the colors in beams with natural wood tones and bring in natural elements that match. Chairs or baskets made from sea grass pair well with blonde or honey toned beams made from pine or oak. Brown matchstick blinds tie in perfectly with dark stained beams and white plaster walls. Walls can be textured with specialty paints like Behr's Venetian plaster applied with a trowel. Paint additives can also produce a stone-like texture or you can add faux texture with a color wash. Add a little character to wooden beams suspended under the ceiling with decorative woven baskets placed on top. Bring in terra-cotta floor tiles for a Mediterranean feel. White-on-white color schemes make rooms bright, soft, and feminine. 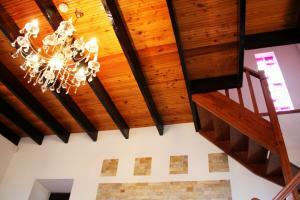 Rough, knotty natural wood beams bring a hint of masculinity and enrich the space with warm rugged texture. Cushion the room's rugged edges with layers of textiles, soft furnishings, and flowing fabrics. Flowers, porcelain vases, and the delicate curves of French furniture look utterly charming under rustic wooden beams. 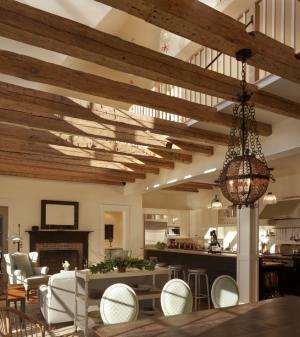 Soften the look of ceiling beams and paneling by adding a skylight or two. Complement light colored wood beams in an all-white kitchen with light toned or weathered wood flooring. The silvery gray tones of reclaimed barn wood planks make a stunning accent wall that pairs beautifully with classic white walls and light toned wood ceiling beams. If your home doesn't have exposed beams and you've decided you want them after seeing how much warmth and character they can add to a room, don't call a contractor to rip your ceiling out. 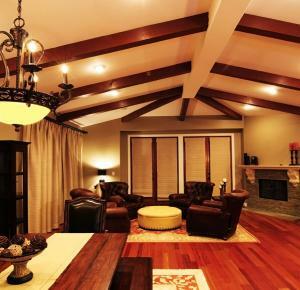 Decorative ceiling beams made from wood and other lightweight materials can be installed on your existing ceiling and will give the room a whole new style.